Original Egyptian High School General Certificate or degrees transcript from the General Department of Examinations. Original degrees transcript stamped by the Egyptian Cultural Consulate in the United States and the General Department of Examinations. Original graduation certificate stamped by the Egyptian Cultural Consulate in the United States. Scores of SAT 1 and SAT 2 authenticated by AMIDEAST and the Egyptian Ministry of Foreign Affairs. Evidence of twelve years of sequential schooling. Original degrees transcript stamped by the Egyptian Cultural Consulate in Canada and the General Department of Examinations. Original results of Arabic and religion exams. Original certificates stamped by the British Council in Egypt, the Egyptian Ministry of Foreign Affairs, and the General Department of Examinations. Please contact the Admission Office for information regarding the required documents for other foreign certificates. Original Secondary School Certificate stamped by the Egyptian Embassy or the Egyptian Ministry of Foreign Affairs. Preparatory School Certificate and first and second year of secondary school (Holders of Secondary School Certificate from Yemen only) stamped by the Egyptian Embassy or the Egyptian Ministry of Foreign Affairs. Original Secondary School Certificates (Grades 11&12) (Holders of Secondary School Certificate from Saudi Arabia only) Stamped by the Egyptian Embassy and the Egyptian Ministry of Foreign Affairs. Original birth certificate stamped by the Egyptian Embassy or the Egyptian Ministry of Foreign Affairs (Non Egyptians only). Note: Copies of documents can be submitted in early admission stages of application. Once an applicant is offered a place in one of the HU degree programs, originals of all the required documents listed above must be submitted in order to complete registration. Applicants must have attained the Egyptian Secondary School General Certificate (Thanaweya Amma) or approved equivalent certificates. HU admission requirements comply fully with the regulations set by the Egyptian Council of Private Universities (CPU). 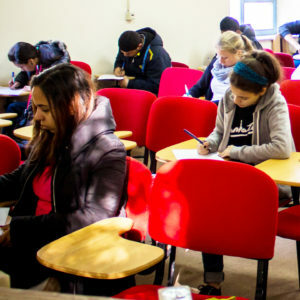 Minimum grades are subject to change in subsequent academic years according to the regulations set by both the Egyptian Council of Private Universities and HU. Please contact HU Admission Office for more information about other approved foreign certificates and qualifications. Applicants must have evidence of twelve years of sequential schooling. Biology, Chemistry, Physics, and one subject in Math or Economics fields. Any other three approved subjects. Advanced Mathematics or SAT II (Mathematics). Five Basic subjects selected from: Economics, Business Studies, French, German, Philosophy, Sociology, Psychology, Consumer Mathematics, Accounting, Statistics, Chemistry, Physics, Biology, Geography, Maths, Global Studies, History, Logic, Social Studies, US Government, and Computer Studies. Any other two approved subjects. Faculty of Pharmacy accepts science section students. Faculty of Engineering accepts math section students. Faculty of Business and Economics accepts all Thanaweya Amma holders to apply for admission. At least four subjects must have been passed in Grade 12 and the rest of the eight required subjects are counted from Grades 10 and 11 with a maximum of two subjects in Grade 10. All students must have passed Grades 10, 11, and 12 in the American system. Eight subjects with at least one credit hour for each are required with an official transcript. SAT I with a minimum score of 800. SAT II with a minimum score of 900 (optional). Total scores of GPA, SAT I, and SAT II (optional) should exceed the minimum grade required for the faculties admission. Eight subjects are required with a maximum of three subjects passed in Grade 11 and the remainder passed in Grade 12. All students must have passed Grades 10, 11, and 12 in the Canadian system. Eight IGCSE/GCSE “Ordinary Level” subjects are required with an official school transcript and a minimum grade of (C). For Faculty of Engineering, one AS Level or A Level in Maths with a minimum grade of (D) are required. The maximum number of AS-Level or A-Level subjects that are counted are: Two A-Level subjects or four AS Level subjects, or one A Level subject and two AS Level subjects. Grade 12 must have been completed. Seven subjects are required and English Language should be included in addition to the subjects qualifying for each faculty. Six subjects are required and must include English Language. Three high level subjects must be included within the six subjects. The Extended Essay and Theory of Knowledge must have been taken but are not counted as one of the six subjects. A minimum of 24 points are required. Seven subjects are required with a minimum of 10 points and must include English Language.